The EDC of my friend M, with not only a full-size pistol and red dot, but also an extra magazine. Red dot optics, also often called by the Trijicon brand name “RMR” (for the brand’s ruggedized miniature reflex sights), are becoming commonplace on range pistols, having first met wide acceptance among sport shooters who love them for fast aiming as compared to iron sights (the term used here for traditional sights, even if they’re non-metallic). They’re popular, but is a red dot a good choice for concealed carry? 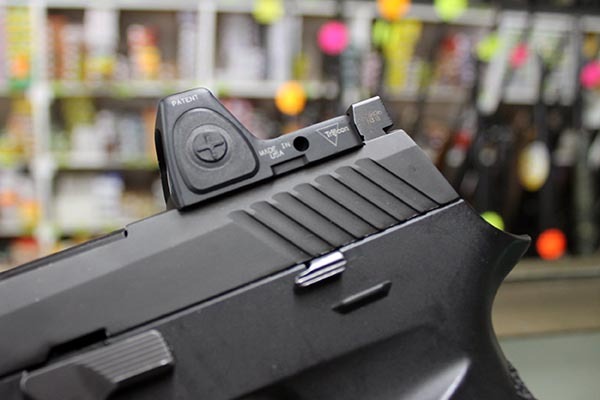 Let’s take a look at some pros and cons of making the leap from iron to electronic sights. Upside #1: Shooting with a red dot is more instinctive. In a gunfight, it’s only natural for the intended victim to focus on the attacker. Bringing focus rearward to iron sights is difficult or impossible for most people. The red dot allows you to focus on your attacker and the sight without having to shift the distance focus of your eyes. What an advantage! Upside #2: The time from draw to trigger press is shortened, with practice. This is the primary reason there’s so much love for red dots in the tactical and competition arenas. It does speed up target acquisition and therefore time to the first shot, however this is a skill that must be practiced. Those who are accustomed to using a red dot on a carbine or shotgun usually find that using one on a pistol isn’t quite as natural at first. Upside #3: A red dot can make shooting easier for those with aging eyes. As eyes change with age, it can become difficult if not impossible to see the front sight clearly. A red dot can be a boon to those struggling with ocular aging. I have seen many aging shooters regain the skill and confidence of a youthful person after mounting a red dot on their favorite pistol. Though it may help you focus better, a red dot can’t identify the target. This pistol is geared for home defense with a red dot plus flashlight and suppressor-ready barrel. Upside #4: It’s easier to be accurate at distance with a red dot. This perk is listed last because distance shots of, say, 25 yards or longer in concealed carry situations are rare. However, it would be the top benefit if hunting or bullseye shooting was the interest. I’ve seen some shooters go from struggle to success on The Humbler drill after transitioning to a red dot. Downside #1: Red dot sights are bulky. For some of us, it’s hard enough to comfortably conceal a pistol and holster under clothing. Adding a square metal frame to the top of your slide will probably require some adjustments to your carry system. 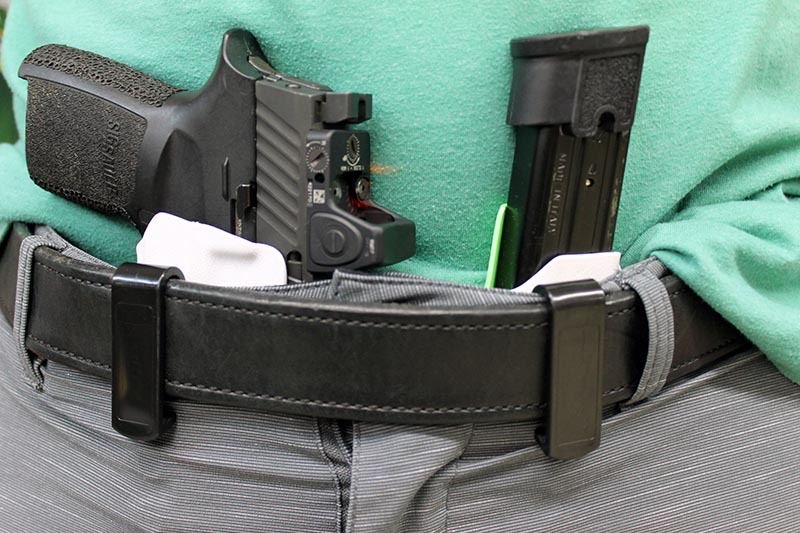 While the sight itself will clear most holsters, that may put the metal in direct contact with your skin—a potential source of pain, chafing, or allergic reaction to the metal. There’s added clothing-snag potential from the taller iron sights that will likely be paired with the electronic sight. Downside #2: Purchasing and mounting a red dot is expensive. Plan on spending several hundred dollars for the sight itself. There are modular mounts that can attach to the slide of your pistol without modifying it, however accuracy and durability are bound to suffer, especially when the gun is subjected to the stresses of EDC. “Milling” or machining a slide to accommodate a red dot is far preferable, and will add $50-200 to the cost of the setup. And don’t forget your standard sights, which should still be visible as a co-witness in the event the electronic sight breaks or runs out of battery. They’ll likely need to be replaced with higher, suppressor-ready sights so as to be visible. 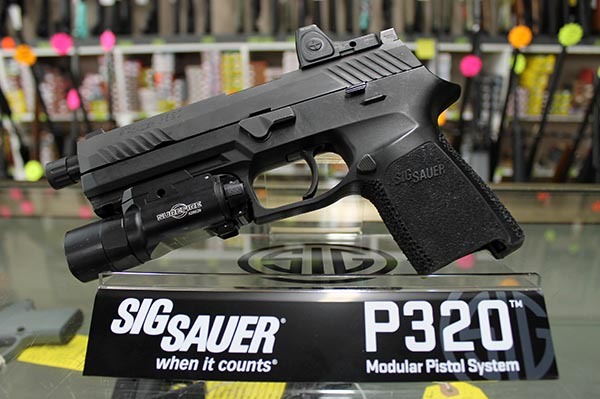 Sig Sauer pistol fitted with a Trijicon brand red dot. Note the pairing of a high rear sight to make the iron sights visible through the optic. Downside #3: Effective red dot use requires training, even on a known gun. There are a couple aspects of training with a red dot that are different from iron sights. Just like a rifle or carbine optic, a red dot must be zeroed at a chosen distance, say 10 yards for defensive purposes. The shooter must know his or her zero and how the gun places rounds on target at distances shorter or greater than the chosen zero. For that “must make the head shot” moment at relatively close range, there is a mechanical offset between bore and sight to take into consideration. Shooters should know their holdovers (or hold-unders, perhaps) are for short and long distances. We are, after all, legally responsible for every round that leaves the muzzle! I have found that red dot use requires a slight adjustment in the angle at which I typically hold a handgun while firing. Becoming accustomed to drawing and finding the dot takes practice, and is important to learn. Another shift required is the mental one, from focusing on the sights to focusing on the target. That one’s usually mastered fast. However, if the shooter carries an iron sight-only gun for work or other tasks, switching between the two systems causes some delays and mistakes for the vast majority of operators. Downside #4: Dot size and brands are often not interchangeable. Red dots usually come with a choice of dot size. A large dot is easier and faster to aim at close distances. However, it may also pose a risk if a precision shot needs to be made, even close-up. Some brands offer brightness settings for the sight—a great option, unless it becomes a distraction or a situation arises in which the setting of choice offers insufficient contrast during a criminal attack. But these are little details, and folks have gotten along fine for years compromising for the different but equal shortcomings of iron sights. When all is said and done, ease of wear is probably the most important factor in deciding whether a red dot is right for your concealment gun. Dedicated practice is a close second. The gun you don’t have on, or can’t operate well, can’t help you save a life. Thanks to M at Courtesy Sporting & Pawn for modeling his Sig P320 and Trijicon red dot EDC setup. Thanks to Shaun at Trijicon customer service for answering product questions. Eve Flanigan is a defensive shooting and lifestyle student, practitioner, and instructor based in the American Southwest. She is a lifelong recreational rifle shooter who began carrying concealed in 2004, which evolved into an interest in defensive handgun training and competing. Flanigan holds NRA Instructor certifications in pistol, rifle, and personal protection in the home. She is licensed to instruct New Mexico’s intensive Concealed Carry course, and regularly designs, conducts, and co-teaches classes on concealed carry, introduction to pistol, defensive pistol, basic rifle, last-ditch medical, and use of force for civilian students. Flanigan enjoys competing in run-and-gun biathlons that include carbine and pistol. Episode 248: Draw Fast…or Draw Slow?? taking a close look at the iron sights on the gun pictured, I do not see how they are any way high enough, especially the front, to cowitness with the RMR OR see over a suppressor. Come on, Eve, before you print pics in your article, do you actually HANDLE the gun to do what you describe in the text? You usually don’t miss little details like that. I’ve had the privilege of firing this pistol and yes the irons are visible through the lens. A lower 1/3 of lens co-witness is a preferred design and that’s what this gun’s owner chose. Thanks for reading the article. The fog from a change in temperature is a deal breaker for me. Do you really think you will have time to turn on a Red Dot in a real fight? For Rifles, competition and play guns – fine – they are fun and can be useful. For Real “Carry” Defense – I cant recommend it on a Pistol. A lot of Red Dots are now motion activated. If you’re not using a motion-activated, red dot optic on your rifle, how would it be any better for CQB than a non-motion-activated red dot optic on a handgun? In neither scenario would it make sense to ask them to hold on a minute while you turn on the optic. There are plenty of reasons red-dot optics are used on handguns, competition and for self-defense. They have their benefits and drawbacks as Eve covers in the article. But one of the drawbacks is not that you have to turn them on. As long as you are not using a low-end optic on your handgun. And why would you, if it is going on your everyday carry gun? My RMR on my handgun is always on thus there is no need to turn anything on. 2 year battery life and you should always check to see if the battery needs replacement. I’ve replaced mine once in 2 years. I have to agree with Defender on this matter. Having used Red Dot sight for a number of years, it is not practical in emergency situations. It is particularly bulky but has made hunting far easier – Whether or not this is practical on a concealed is debatable. @KG – How often do you use your handgun? Leave a Reply to Trevor Miller Click here to cancel reply.